A Powerful Story of 9 Strange People! This landmark 1939 Western began the legendary relationship between John Ford and John Wayne, and became the standard for all subsequent Westerns. It solidified Ford as a major director and established Wayne as a charismatic screen presence. Seen today, Stagecoach still impresses as the first mature instance of a Western that is both mythic and poetic. The story about a cross-section of troubled passengers unraveling under the strain of Indian attack contains all of Ford's incomparable storytelling trademarks - particularly swift action and social introspection - underscored by the painterly landscape of Monument Valley. 1939’s Stagecoach turned out to be an absolutely terrific movie. Exciting, funny, touching - this sucker packs the whole magilla and even manages not to seem as dated as most movies of its era. Before I screened it, all I knew about Stagecoach was that it was a Western that paired John Wayne with director John Ford. As such, I expected a typical "shoot-em-up with Wayne as some archetypal hero who kills lots of Injuns and saves the day, blah blah blah. That's not what I got. Actually, Stagecoach really isn't a "star vehicle" for Wayne at all. It's an ensemble piece and he doesn't even appear until about one-third of the way into the movie. The story takes a disparate group of folks, packs them into the eponymous wagon and details what happens to them as they make a risk-fraught trip through Apache territory. While Stagecoach definitely offers some terrific action scenes – when the Apaches finally attack toward the end of the film, it's a doozy - it's really more of a personality drama as we observe the interactions of the characters. Wayne is surprisingly subdued and lacks the inflated swagger I associate with him. His performance as semi-outlaw "Ringo" seems honest and very human. The other actors are uniformly very good. I sometimes have trouble with older films because the acting style is so much broader and more theatrical than we see now. That was one of the reasons fellow 1939 Best Picture nominee Of Mice and Men turned me off so greatly. Happily, that's not really the case with Stagecoach. While I wouldn't call the performances naturalistic, they seem appropriate and don't stand out in a negative way. While I remember Stagecoach as a Wayne picture, the actor who enjoyed the most success due to it was clearly Thomas Mitchell. Probably best known as Uncle Billy in It’s a Wonderful Life, Mitchell appeared in three of the ten 1939 Best Picture nominees; in addition to Stagecoach, he featured in Mr. Smith Goes to Washington and eventual winner Gone With the Wind. Although playing a drunk doesn't seem unusual for Mitchell - Uncle Billy enjoyed his booze, as did "Diz" in Mr. Smith... - he manages to make Doc Boone quite real and full in this film. That's probably why he won the Oscar for Best Supporting Actor. Stagecoach is such a well-realized film that even parts of it that could - and probably should - fail don't. I found the movie to be much funnier than most old films. Lots of humor doesn't cross generational barriers well, but parts of Stagecoach were laugh-out-loud funny. And yes, they were supposed to be funny - no campy snickering here. The jokes themselves aren't that hot and a lesser movie would have bombed with them, but they work here. For example, one running gag concerns the fact no passenger can accurately remember the name of one other character. That bit has massive potential to flop, but it's portrayed so gently and subtly that it actually works. I should have cringed as the gag kept going and going, but the cast offered it so honestly that it stayed entertaining. I can't emphasize how wonderfully entertaining and terrific Stagecoach was. It came as a complete shock, but it was a very happy one. Stagecoach appears in an aspect ratio of approximately 1.33:1. Because of those dimensions, the film has not been enhanced for 16X9 televisions. Though it didn't look much worse than you'd expect a more than 65-year-old movie to look, the picture of Stagecoach was a disappointment because it's clearly worse than a movie of its caliber should look. Overall, sharpness seemed good with only a few sporadic instances of softness. The movie occasionally became ill-defined, but not with much frequency. Moiré effects and jagged edges were not a significant problem, but I noticed moderate edge enhancement through the film. Print flaws were a more serious issue. The movie looked excessively grainy at times. I also noticed vertical lines that often ran up and down the screen as well as speckles, scratches, blotches, hairs and other debris. The image flickered at times and also could jump. I’ve seen messier transfers, but I’ve also seen many cleaner ones. Black levels varied quite a lot throughout the film but tended to be somewhat too dark and heavy. At times brightness seemed too strong but those occasions were rare and the image usually appeared overly dense. It's not a terrible problem but it could interfere with shadow detail, which often seemed murky and overly opaque. 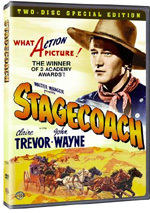 Despite its flaws, Stagecoach remained watchable. Still, I couldn't help but feel this film could really benefit from an extensive clean-up job. More satisfactory was the movie's adequate monaural audio. I don't expect a whole lot from old soundtracks, and Stagecoach didn't give me much, but it worked decently for a film of its era. Dialogue could occasionally be a little hard to understand, but it's usually clear and reasonably natural. Both effects and music seemed decent but somewhat tinny and flat. The track displayed consistent hiss throughout the movie but I discerned no significant distortion. Again, it's not a particularly good track, but for such an old movie, it seemed a bit better than average. How did the picture and audio of this 2006 DVD compare to those of the 1997 release? To my surprise, they were very similar in quality. I expected the 2006 transfer to offer a substantial improvement ala the excellent Searchers DVD. Unfortunately, the 2006 Stagecoach looked just as bad as the 1997 version. Both narrowly avoided “D+” grades, and the audio was similarly acceptable but no better. While the old DVD included only a few minor extras, this two-disc special edition provides a nice package. On DVD One, we get the movie’s trailer and an audio commentary from Scott Eyman, author of Print the Legend: The Life and Times of John Ford. He gives us a running, screen-specific chat. Eyman covers an expected roster of topics. He focuses on the lives and careers of director Ford and star John Wayne, and he discusses their long-term relationship. He also compares the original short story and the movie along with various cast and crewmembers, the Monument Valley location, issues with the studios and the censors, the film’s impact on its genre, and various production notes. All of that is exactly what I want from a commentary of this sort. Eyman always proves lucid and concise as he details various subjects. He inserts many nice anecdotes and keeps things moving well. Eyman gives us an excellent view of the production and those connected to it, so I highly recommend this commentary. As we shift to DVD Two, we start with a documentary entitled John Ford/John Wayne: The Filmmaker and the Legend. This show runs one hour, 23 minutes and 30 seconds as it mixes movie snippets, archival materials, and interviews. We find comments from Eyman, filmmakers Martin Scorsese, John Milius, Peter Bogdanovich, Mark Rydell, and Andrew V. McLaglen, film critic Richard Schickel, film historian David Thomson, biographers Tag Gallagher and Joseph McBride, grandson Dan Ford, son Patrick Wayne, editor Robert Parrish, cinematographer William H. Clothier, and actors Harry Carey Jr., Pippa Scott, Jack Williams, and William Wellman Jr. We also discover archival remarks from Wayne and Ford. “Legend” starts with a biographical sketch of Ford and progresses through his career development and style. We also learn how Ford and Wayne came together and how they coalesced. The show covers their relationship and other aspects of their personalities. In addition, we find information about activities during WWII, political leanings, and details about some of the movies they made together or separately. I worried that “Legend” might stumble as it attempted to tell two stories. However, because the careers of Ford and Wayne link so intensely, the show succeeds. It digs into their personal and professional sides well and doesn’t spare frank concepts and opinions. We already know some of the material from the commentary, but this provides plenty of new details and creates a full picture of its subjects. A movie-specific documentary called Stagecoach: A Story of Redemption fills 30 minutes and 28 seconds. It presents McBride, Dan Ford, Bogdanovich, and film historians Rudy Behlmer and Michael F. Blake. “Redemption” starts with a recap of the Ford/Wayne relationship and progresses through the choice of Stagecoach as a Ford project and its adaptation. We also hear about resistance to Wayne’s casting in Stagecoach and other issues connected to bringing the flick to the screen. From there we move through casting other actors, shooting in Monument Valley, stunts, the Wayne/Ford relationship, cinematography, other production specifics and the movie’s reception. We get a pretty nice recap of Stagecoach from “Redemption”. It touches on the highlights and covers things in a succinct manner. Inevitably, it duplicates information found elsewhere, but it still stands on its own to create a nice examination of the film. Finally, we get a 5/4/1946 Academy Award Theater Radio Adaptation. In this 28-minute and 20-second program, Claire Trevor reprises her role as Dallas and Randolph Scott takes over as Ringo. The pared-down narrative sanitizes things and focuses on the Dallas/Ringo relationship to the exclusion of most other issues. It’s fun to hear this adaptation, though, and it makes for a nice extra. Does this release lose anything from the 1997 DVD? Yup. It drops some “Cast and Crew Biographies” along with trailers for films from Ford and Wayne and a few text screens full of production notes. Only the trailers’ absence comes as a disappointment; though these all appear on their respective DVDs, it was nice to see them together in one place. Stagecoach is absolutely terrific and clearly deserves its status as a classic. It’s one of those rare films that makes me want to see more from its participants. Unfortunately, picture and audio quality are problematic, though this set throws in a strong set of extras. I definitely recommend Stagecoach, and this special edition is the one to get if you don’t have the earlier release. For fans who already own that version, though, you only need to “double-dip” if you’re interested in the supplements. They’re good and worth your time, but you won’t find any improvements in picture or audio here. Pursestrings note: this version of Stagecoach can be purchased on its own or as part of an eight-movie “John Wayne-John Ford Film Collection”. In addition to Stagecoach, this box includes the “Ultimate Collector’s Edition” of The Searchers as well as They Were Expendable, She Wore A Yellow Ribbon, 3 Godfathers, Fort Apache, The Wings of Eagles and The Long Voyage Home. For those interested in all the movies, the boxed set acts as a terrific bargain. The eight flicks list for $169.78 individually, while the box combines them for $79.92. $90 off of list price offers an amazing incentive to pick up the boxed set.